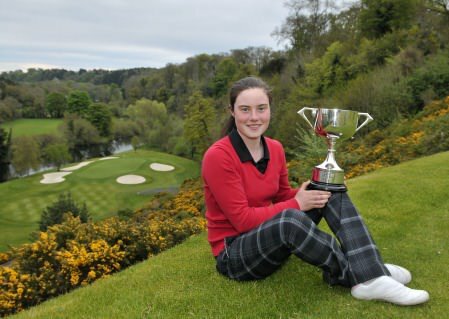 Mini marvel Leona Maguire became the youngest winner of the Hermitage Ladies Scratch Cup on Sunday - aged just 12. The Cavan twin fired rounds of 75 and 72 at the classic Lucan track - just one over par - to win by four shots from Ireland international Maura Morrin. Cut from three to two handicap for her win, Leona is just one half of a talented Slieve Russell pairing. Her twin sister Lisa is also a two-handicapper and the golfing sisters will create history next month when they tee it up in the Northern Ireland Ladies Open in Belfast from June 1-3. Proud Dad Declan said: "Leona is absolutely delighted. Conditions were very tough and she was so happy to win after finishing second in the Lahinch Scratch Cup just last week." The Maguires have received a special invitation to play in the €200,000 Northern Ireland Ladies Open on the Ladies European Tour next month. In-form Leona Maguire will be bidding to continue her winning start to 2009 when she defends the Lancôme Irish Women's Close Championship at Fota Island Golf Resort from May 16-20. Leona Maguire: "Playing on the LPGA Tour would definitely be the dream"
They might be heading for Duke University in August but the dream of life on the LPGA Tour remains very much a goal for the Lisa and Leona Maguire.